As we speak I am trying not to overthink my uni packing too much and have decided to go for the 'take all you can fit' approach, which seems to be working out..for now at least. After spending too much time selecting clothes I decided to do head to my bathroom for a smack-down of products there instead. It turned out to be a quick 'un and since I now have my staples in front of me I figured I'd do a Hair Care post before I stack them in a corner of the small *erhm-large* beauty section of my suitcase. I do like to take care of my hair, but I in contrast to my make-up routine I like for it to be quick. Because of that I do most of the 'care-taking' whilst I'm in the shower and leave only one or two products for afterwards. For a good old thourough cleanse of my hair I usually opt for Aussie's Mega Shampoo or Miracle Moist Shampoo both of which smells like heaven in a bottle. I use the latter mainly when my hair is over on the dry side of things and the other for just a nice clean scalp (ugh that sounded gross). 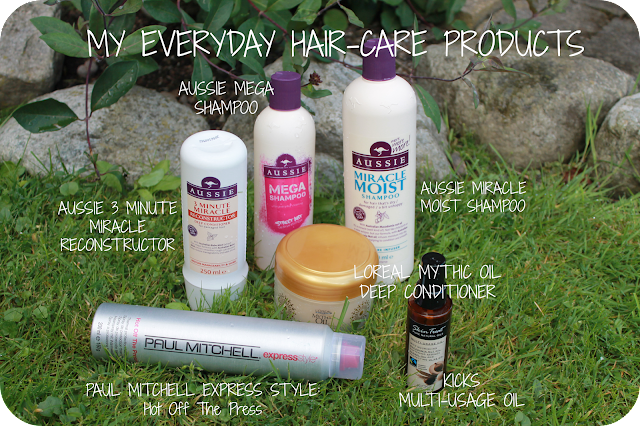 For the days when I want to wash my hair as quickly as possible but still have it looking good Aussie 3 Minute Miracle really is a miracle and a life saver. Glossy, soft hair in no time - or at least 3 minutes which gives you just enough time to scrub your body, shave them legs or cleanse your face. For the days when I have a few extra minutes I take my fairly new found love L'oréal's Mythic Oil, a smooth, buttery/oily - but not grasy or heavy- deep conditioner. I apply this from my eras and down, focusing most of the product at the ends. This should be called mystic oil because god knows what they put in this that makes your hair so darn amazing. I haven't seen a dry tip or split end in weeks and that's a rare sight, so mahusive thumbs up for this guy. 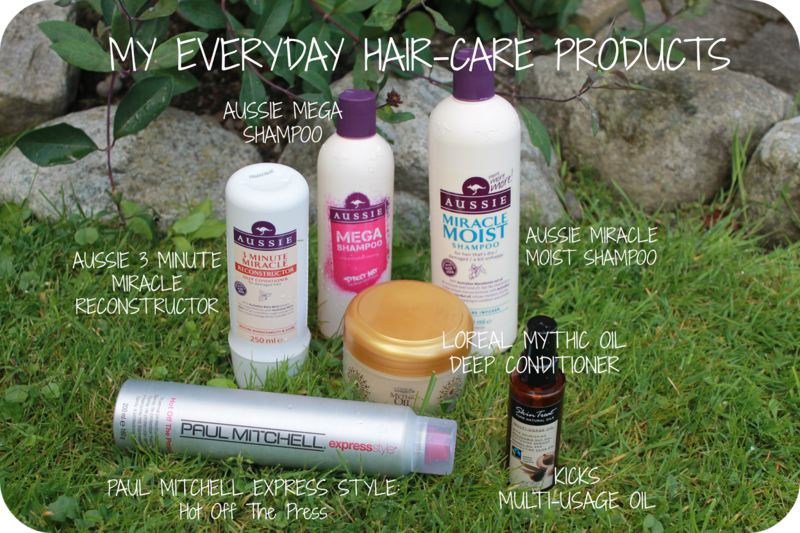 By using these products I have managed to get my hair to a state where it's not heavy, über glossy and flat with too much stuff in it but not dry and frizzy either. Just nice and soft with a little shine! Let me know what you use on your hair! If you liked this post I would really appreciate it if you'd follow me on Bloglovin' HERE. great tips! follow each other on gfc? Mmmmm Aussie! 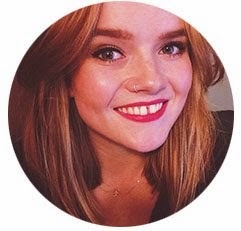 I'm your newest follower on bloglovin!